Pool Party at Camp Cameron! It felt great driving back into Washington and the Pacific Time Zone! We stopped in Kennewick for a nice visit with Mike’s dad before our destination in Yakima. As we pulled up the driveway to Sunny & Mitch’s (aka Camp Cameron), we were greeted with the best ever welcome sign (see pic below). The annual pool party didn’t officially start until Friday, but they let us roll in a bit early on Wed. My mom drove over from Bellevue and Sunny’s parents, Jerry & Ann, were there, so we had a great couple of days catching up, BBQing and hanging by the pool before the big group arrived. What a treat to have my mom come over and spend some time together. Loved it! On Friday, we had a group of 12 golfing at Apple Tree and it was toasty! The pool was a welcome site that afternoon. The rest of the group arrived that afternoon/evening and the festivities were on. 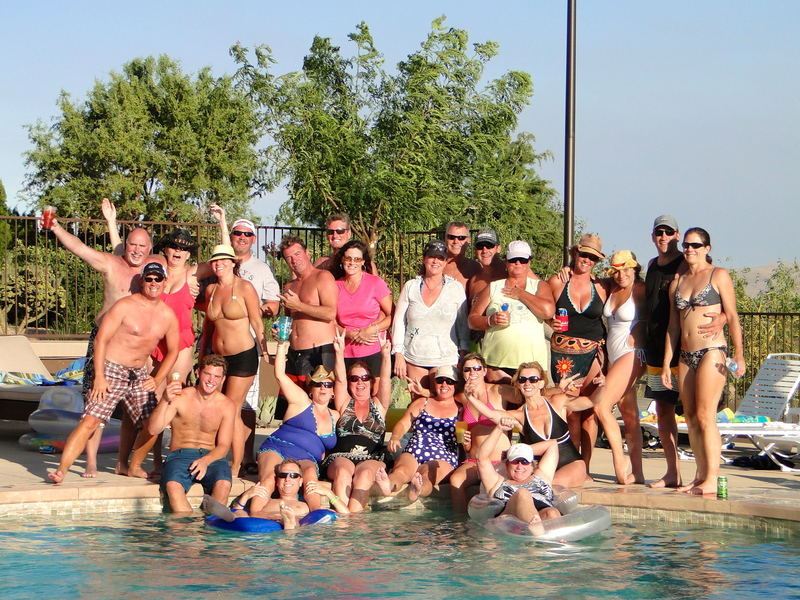 Food, drink, music, games, pool, hot tub, sunshine and good friends catching up – it doesn’t get much better than that! As usual it was a huge success and the Cameron’s were gracious hosts as always! Most people left on Sunday/Monday, but we stayed one more day until Tuesday. So far, Camp Cameron has been our favorite RV Park! 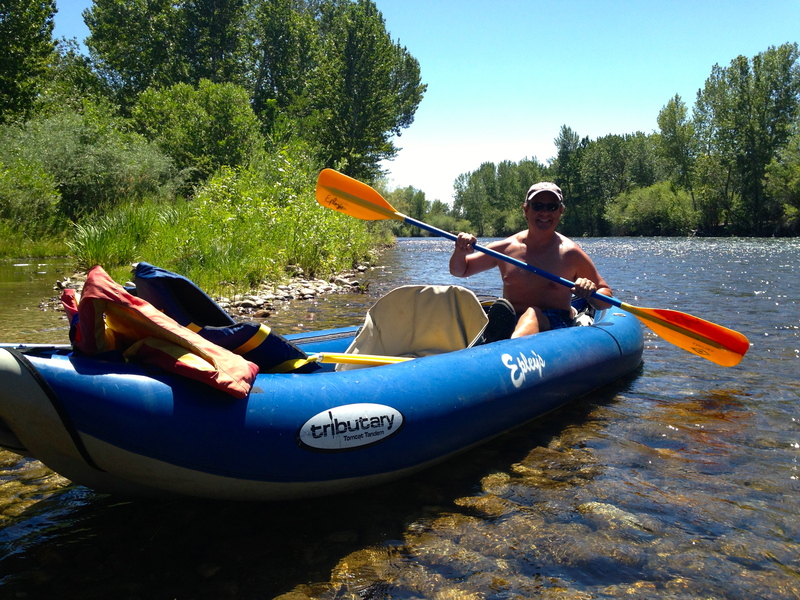 We rolled out of Yak on Tuesday morning enroute to Wenatchee and the Pflugrath’s (aka Casa de Pflu). Their neighbors allowed us to park the MoHo in their driveway and we slept inside the house, which was actually a treat. Shelly & Marc are babysitting our bed while we are on the road, so it was nice to sleep in it again! They wined & dined us and we enjoyed their back patio and amazing view. The smoke from the fires was starting to settle in; hopefully it doesn’t repeat the horrible smoke they had last year. On Wednesday morning we had a little excitement. Mike ran over to the MoHo to get some stuff out and he discovered a rattlesnake resting comfortably under the back tires. It certainly got his attention for the next 20 minutes until it slithered back into the bushes down the hill. We called Marc to see what we should do and he told us “stay away from it.” Thanks Marc, genius. Shell & I went to get much needed pedi’s, met the boys for lunch then took the boat out on the River. We were enjoying the calmness of the river and just getting settled near the sandbars, when we noticed that a storm was brewing – wind and rain. We decided we better head in, but when we tried to start the engine it was DEAD. Looking around there was no one left on the river due to the bad weather, so Marc had to swim into shore walk down to the closest boat launch to get someone to tow us in while Mike, Shell & I tried to keep the boat from blowing into the rocks. Can you say cluster! We made it home about 3 hours later than we wanted, but safely and laughing about it. Stopped at McGlinn’s for takeout and enjoyed another fantastic evening at Casa de Pflu. Heading up to Canada today for 2 weeks! Can’t wait. First stop is Penticton/Summerland. Wi-Fi will be very rare and spotty for us and we have turned off the data on our phones, so it may be awhile before we can post. 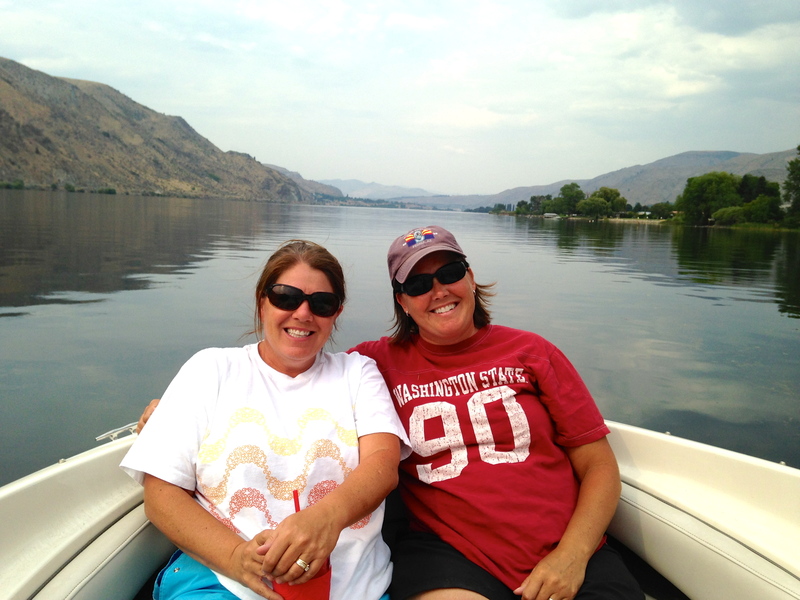 This entry was posted in July 2013 and tagged Boating, Camp Cameron, Columbia River, Golfing, Pool Party, Washington, Wenatchee, Yakima on August 1, 2013 by Traci. The drive from Pocatello was a long one, but uneventful – no big mountain passes and nice wide highways! 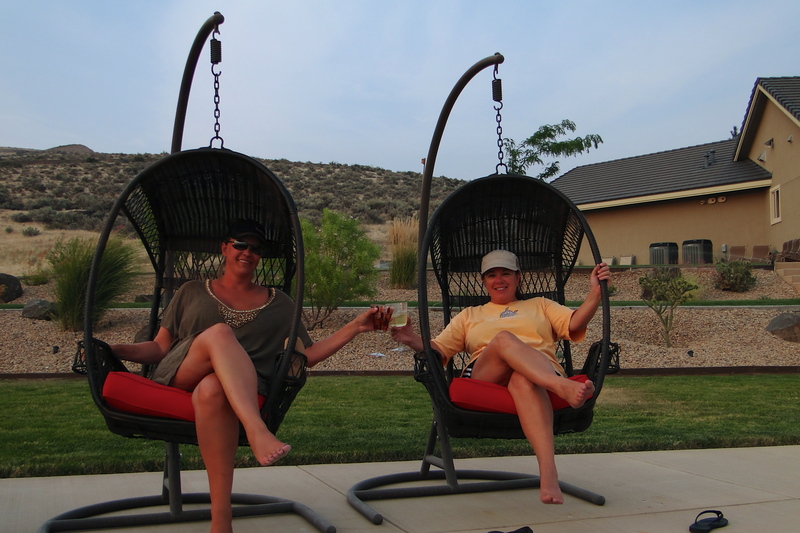 Arrived in Boise and the Hi Valley RV Park and into some heat – triple digits all 3 days. But as everyone tells us, “it’s a dry heat.” Whatever – still feels too hot to me. Thank goodness for a/c. We met a longtime friend of Mike’s mom, Max Clark and his wife Linda, for dinner at a local Mexican joint. Yummy food, marg’s and great conversation! The next morning, Mike & I headed down to the Boise River with our cooler packed. We rented a kayak and floated the river. It was another cooker, so being on the river was the perfect activity. That night, we went over to Max & Linda’s condo for dinner. They live right in downtown Boise on the top floor of their building. Amazing views including one of Boise State football stadium! Mike’s cousin Melissa came as well – she works for KPMG in Seattle, but happened to be in Boise on assignment through the end of the month. Max & Linda wined & dined us and we chatted for hours. What a treat for us to have dinner at their home — I know Melissa appreciated a home cooked meal as well! Somehow, we forgot to take a group photo and their amazing place – darn, it would have been a good one. Today, we had a lazy morning. I got caught up on the Bachelorette (I know, pathetic) and we got some chores done around the MoHo. 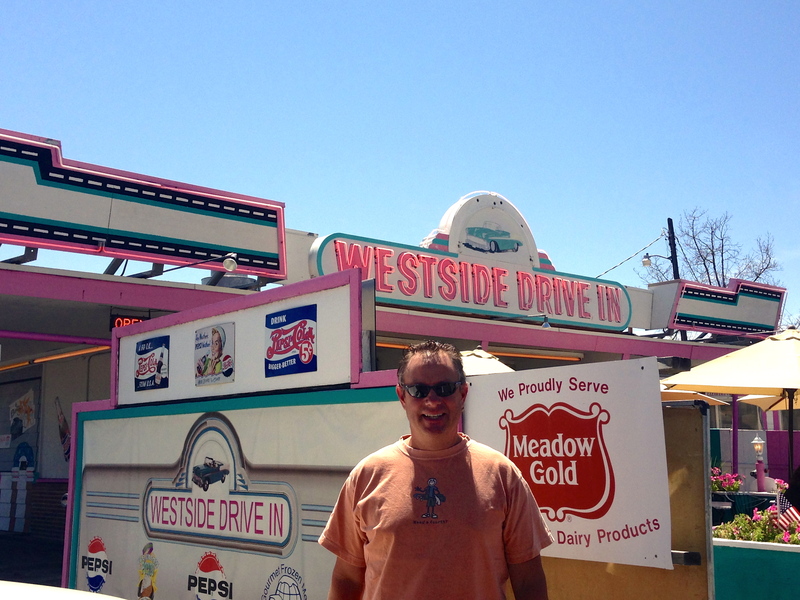 We had lunch at a ‘Diners, Drive-In’s and Dives’ favorite, Westside Drive-In, and it was quite tasty — especially after all of the vino we drank last night! 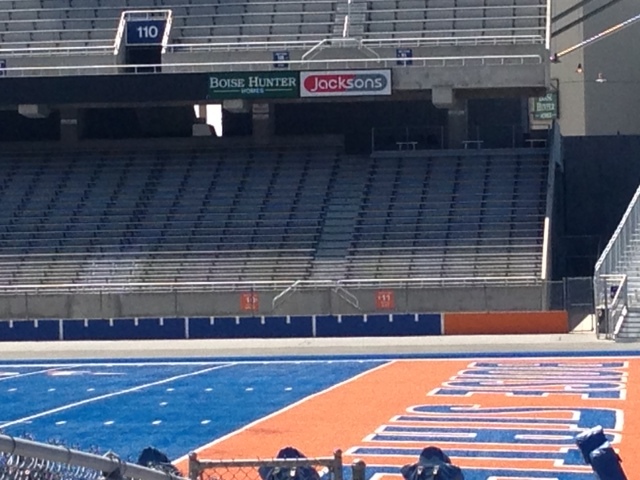 We drove over to Boise State to see the blue turf up close and check out the college campus. Then, we did some wine tasting and hit Payette Brewery for Mike’s IPA fix. We did a Costco run and then back to MoHo to enjoy our final evening in Boise. It has cooled down to 90 so we can actually sit outside and enjoy the night. Still a bit toasty, but I think we may be getting used to it. Mike’s friend Eric and his family, who we met up with in Yellowstone, have just arrived in Boise and are staying at the same place we are. We will hang out with them tonight and then get on the road early tomorrow. We have been on our adventure for over 2 months now. All is well and we are definitely getting in our groove. I am very excited for our upcoming week in Yakima and am so looking forward to catching up with friends. Next stop…Camp Cameron! This entry was posted in July 2013 and tagged Boise, Boise State Broncos football, Diners Drive-In's and Dives, Kayayking on July 23, 2013 by Traci. 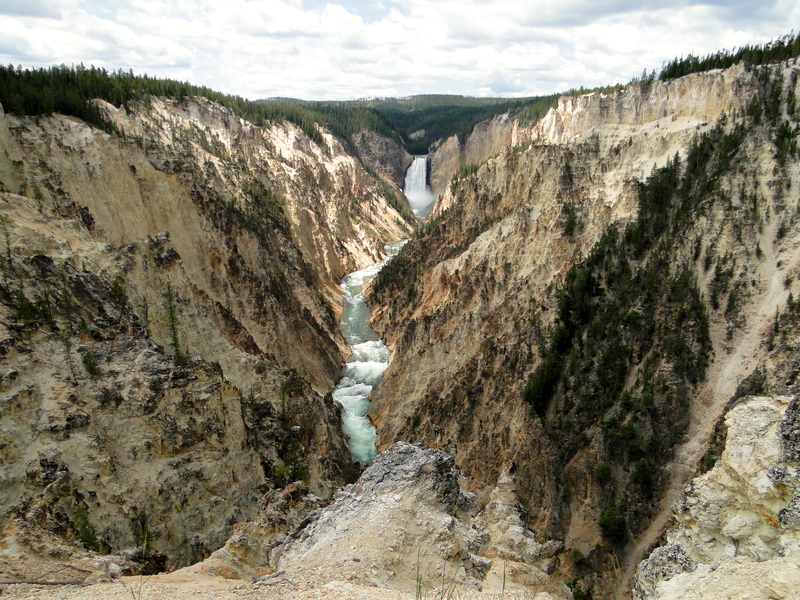 Yellowstone River and Waterfall – it looks like a painting! We left Steamboat Springs and decided to just go for it and do the long drive all the way to Victor, ID instead of stopping for just one night in Rock Springs, WY as we had originally planned. The last bit of the drive from Jackson, WY to Victor is over another one of those fun passes (Teton Pass) we have gotten to know so well, and Traci hates every one of them! The MoHo has handled these high altitude/steep grade challenges like a charm, and I can’t say enough for the exhaust brake system. (The exhaust brake is a button I control and it basically downshifts the MoHo for me to keep my foot off the break. Awesome when you are trying to slow down 35,000+ lbs.) We stayed in Victor at the Teton Valley RV Park, mostly because Jackson was full. We arrived at about 5:15PM and there were 6-7 people there to greet us at the registration office. 5PM is the shift change for the park staff, and those leaving and the others not working decide to make it their own happy hour, what a welcoming committee! Next day we headed to Jackson, also known as Jackson Hole. We had to drive back over Teton Pass, and I had to downshift the Acura to keep the brakes from overheating. Did some wandering in Jackson, and then did a nice little scenic drive from just south of the Grand Teton National Park to Jackson Hole village. The village was beautiful, looked like it would be a lot of fun in the winter. We stayed around to take a free Gondola ride and to have some early dinner up on the mountain, only to find out that it does not run on Saturdays, oops. Sunday we went back to Grand Teton NP for a hike and sightseeing. Took a short hike on a very quiet trail, so quiet that we decided to turn back as this is bear country and we just felt a bit nervous. We hadn’t purchased any bear spray yet! We drove the rest of the way through the park; the Teton’s are absolutely stunning mountains! Some great wildlife and scenic pic’s (see the link above) and a nice overall day. We finished back at Victor with a brew at the Grand Teton Brewing Company, and I got to refill the 40 oz growler I got back in Denver. 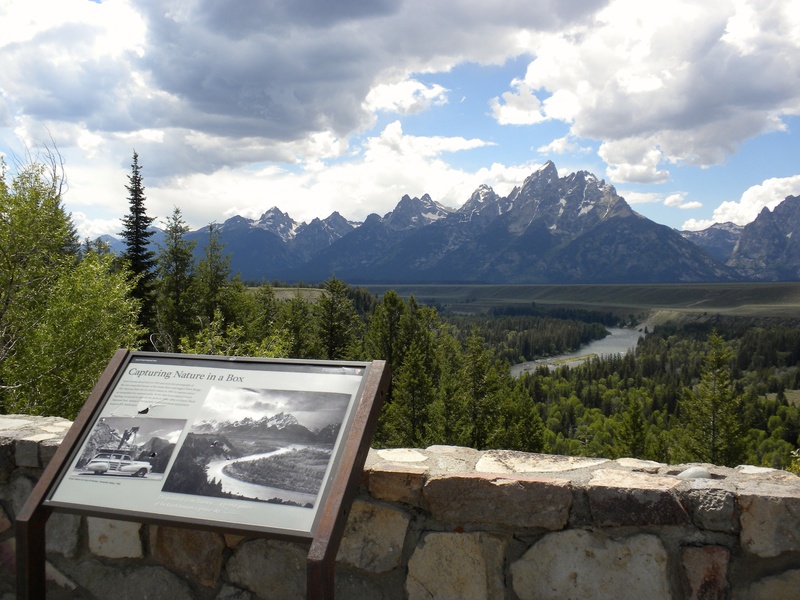 Ansel Adams took a pic of this amazing view of the Snake River & Tetons in 1942. I tried to capture the same shot – pretty impressive! 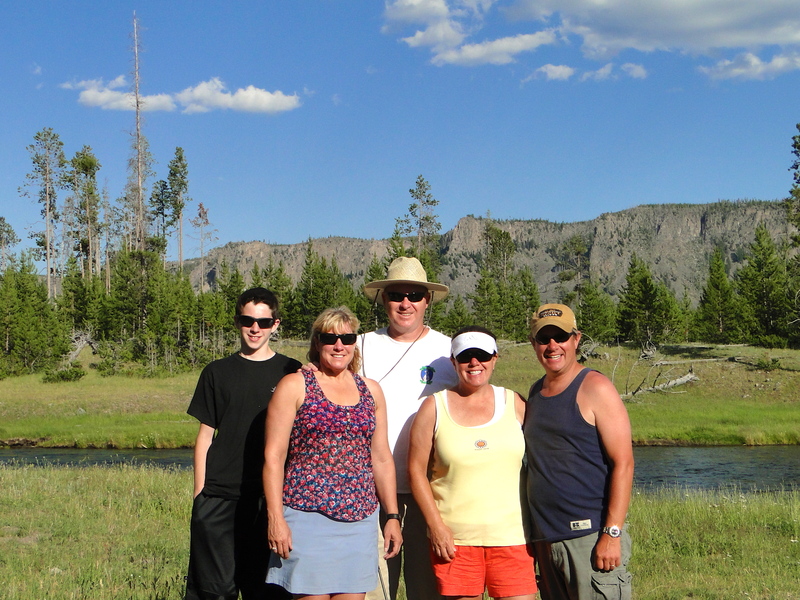 The next day was on to Yellowstone to meet up with my college roommate Eric and his family. We stayed at the Grizzly RV Park in West Yellowstone, a bit pricey, but nice big RV sites with grass, lots of room between RV’s and great access to the park. The first afternoon and night were quickly lost to being with friends, and a lot of vino was had by all…almost too much if that could ever happen. The next morning Traci and I headed in Yellowstone National Park about 11:15AM, a very late start and we paid dearly for it. There were three cow Elk inside the park about 12 miles from the entrance, but the backup was 7 miles long just to see them, worse than sitting in Seattle traffic! We finally got through that mess over an hour later and did a northern loop through the park. 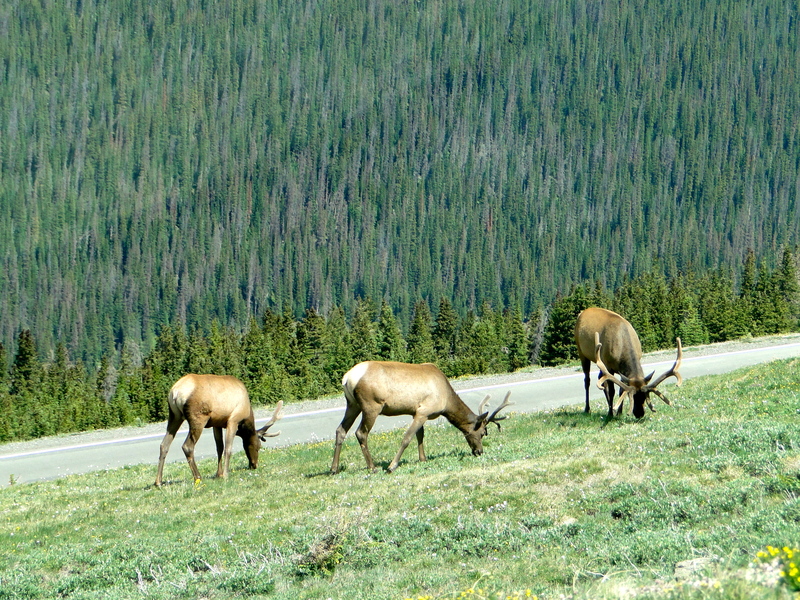 Here is a short video of the elk that caused the traffic jam: MAH06810. We headed up to Mammoth Hot Springs area, stopped a few times for wildlife and scenery. (Again see the pic’s attached in the photo stream, be sure to let them download completely to see the detail!) Mammoth was beautiful, but it was a bit wet that day, so we hurried through to keep the drive moving. Heading east, just past a road construction site, we saw the tell-tale signs of wildlife approaching. People just stop and halfway park their cars for a picture, regardless of the road, other drivers, etc. It reminds me of the professional garage sale shoppers who just park in the middle of the street, really? This was an unusually busy area of cars so we decided to try and find a safe pull out. We got ½-mile beyond the main group and talked to a guy who said there was a grizzly bear back at the area everyone was stopped. We had to get parked closer, so we found a safe spot, and made the little trek out to the bluff where everyone was standing, listening to a Ranger talk about this particular bear. His name is Scarface, a 24-year old male whom the park-staff know well. He was way down in the canyon below, probably about ½-mile away, perfect distance for safe viewing. After leaving there we continued on and there again we came across another crazy bunch of people pulled over, this time someone said there was a bull moose nearby. This moose was lying down, taking his afternoon siesta, so the pic’s were challenging to see his rack in the woods/stumps, but still impressive. The rest of the day we just drove the loop and got back to the MoHo around 7PM for dinner and a lot less cocktails that night. 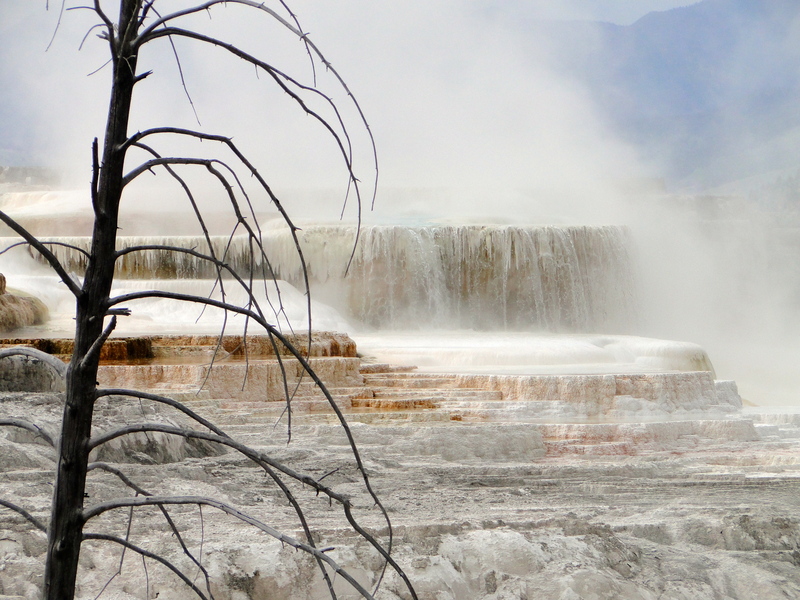 Mammoth Springs – a totally different landscape! The next morning we were out of the MoHo by 7:00AM, not to get stuck in that same mess of cars again, and headed to Old Faithful for the approx. 8:30AM eruption. She came through like a charm at about 8:40AM, just as I remember when I was here as an 8 year old kid. We headed over to the General Store and I found a fly rod; pole, line and reel ready to go. (I used to fly fish, lost my gear in a move and never replaced it, now was the time!) 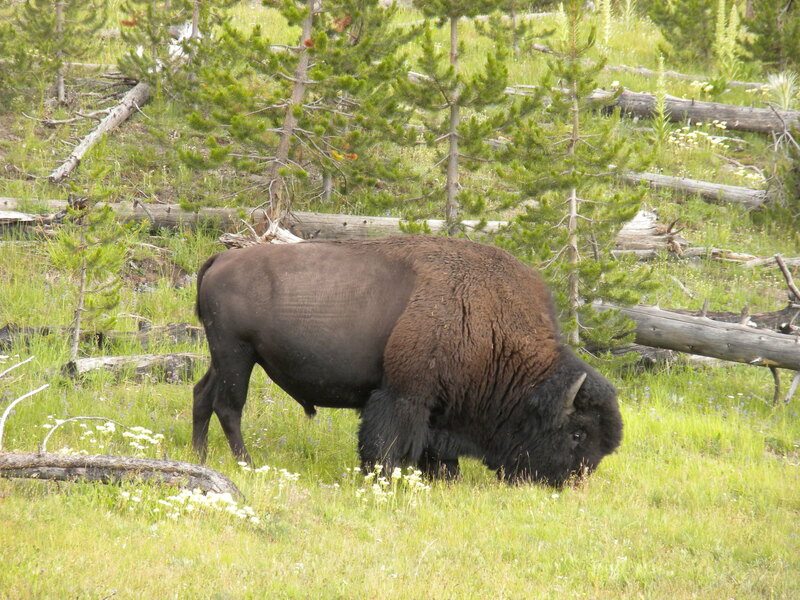 We continued to see the sights of the southern loop, tons of bison in herds and on the road, very large animals that you can almost touch from your window, but I would not recommend it! Met back for dinner and drinks at the MoHo with the Overholt’s, and another late evening. I got up early the next morning, chomping at the bit to get out and use that new fly rod. Tried my luck on the Madison River on the west side of the park, but it had been awhile and my presentation and limited fly selection were not to the liking of any of the resident fish, oh well. We spent the day in West Yellowstone, shopping and tourist stuff. That afternoon, we took a cooler, chairs, and poles back to the Madison River for a relaxing afternoon of fishing and sunning, before coming back out of the park for a dinner at the Wild West Pizzeria – darn good pizza! Friday AM I was back on the river for awhile, again shut out but had a great time. We said goodbye to the Overholt’s and headed out about 11:00AM to our next stop, Pocatello, Idaho for a few nights before heading to Boise, and then Yakima for pool party! 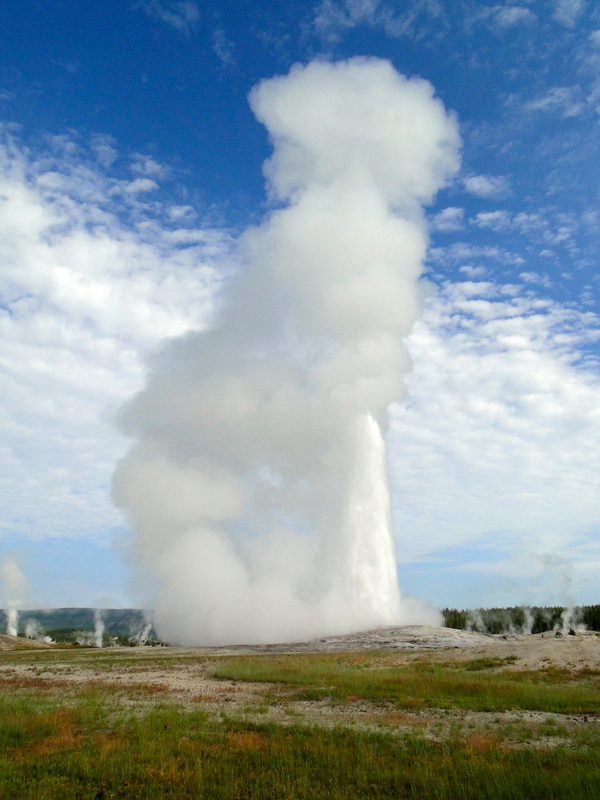 Note from Traci – this was my first visit to Yellowstone (at least that I remember) and I was so impressed by the diversity of the park. It is the first established park in the national park system and it did not disappoint. The wildlife was amazing – I saw more here than I have ever seen in Alaska. The geyser’s everywhere were bizarre to me, but very cool. Seeing Old Faithful was the most touristy thing we did, but one of those sites you just have to see! Then there were lakes, rivers, waterfalls and mountains that were spectacular. The number of people rolling into this park every day was staggering, but once inside the park, and cars branched out to different areas, it didn’t seem that crowded. If you have never been, this is a must-visit on the bucket list! This entry was posted in July 2013 and tagged fishing, Grand Teton National Park, Jackson Hole, National Parks, Old Faithful, wildlife, Yellowstone National Park on July 20, 2013 by Mike. 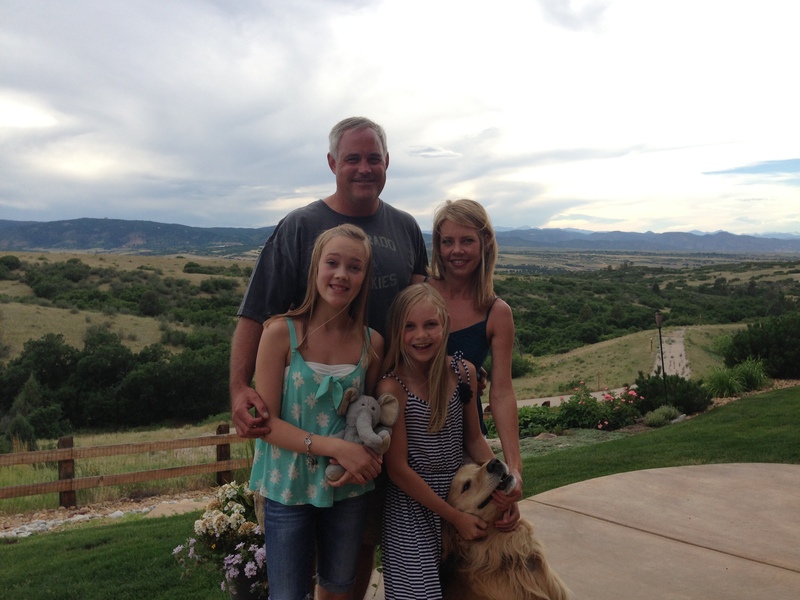 Colorado continues to impress us with its breathtaking scenery, cool towns and friendly people! The weather here is wild. We could go from hot sun to rain, hail, thunder & lightning back to sun in 15 min’s. Kind of cool, especially for weather boy, Mike. His Intellicast app is definitely getting a workout! It is nice though as we know any bad weather will soon pass, unlike Seattle, where the rain pretty much stays all day once it arrives. We said goodbye to the Arreola’s in Broomfield after being treated to 3 nights of luxury at their house, and headed north to Estes Park. This is a very cool town in the mountains, surrounded by snowy peaks, lakes and rivers at the entrance to Rocky Mountain National Park. Our home for the next 3 nights was Estes Park campground at Mary’s Lake. A great spot and Mike finally had a chance to fish! He caught one small trout, but not worth keeping, so threw him back in. We explored the town of Estes Park which consists of lots of shops, galleries, restaurants, bars, a winery and brewery. 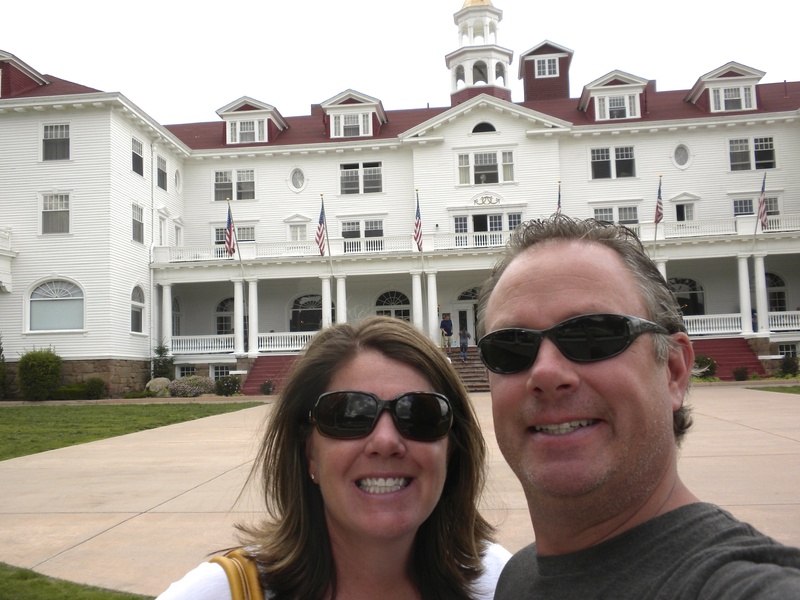 We headed up to one of the main attractions here, The Stanley Hotel. 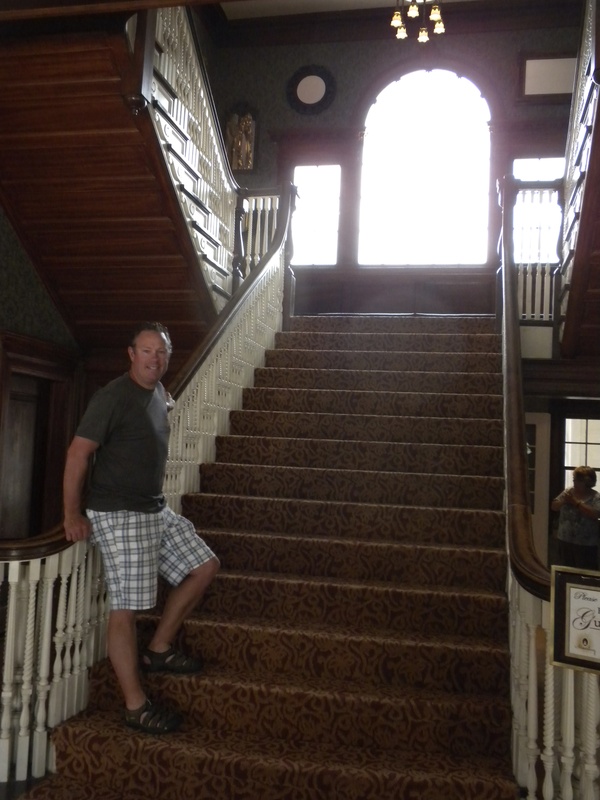 This is the hotel that Stephen King based the Shining on. But, better yet, it is also where many scenes from the movie Dumb & Dumber were filmed. This is one of Mike’s favorite movies and I love anything Hollywood-ish, so we had to go! We had a drink in the bar and took some pics. See if you recognize any of them from the movie. After exploring town, we headed back toward our campsite and detoured to Mary’s Lake Lodge. Sat on the deck, had dinner and enjoyed the incredible view. Doesn’t get much better than this. I would recommend this area to anyone coming to Estes Park as it feels out of the hustle bustle of town, but still close and provided great access to the National Park too. The next day, we planned to head into the National Park. Mike was gung-ho to do some more fishing, so we planned our hike out to a lake and he packed his gear. When we arrived in the park, we learned there was road construction in the area we wanted to go. We weren’t allowed to drive our car, so had to rely on their shuttle system. They could certainly take a few pointers from Zion, but it all worked out. About a mile into our hike, we arrived at a cool waterfall. We got caught in a huge hail/rainstorm which we weren’t prepared for. I wasn’t feeling that great, so we decided to turn back. So much for the hike to the lake. We made our way back through the shuttle ordeal to our car and decided to take a scenic drive to another part of the park – a gravel switchback road to the Alpine Visitor Center at 11,796 ft elevation. The rain followed us though and unfortunately, we couldn’t appreciate the view as much as we would have liked. Headed back to the MoHo where Mike did some more fishing at the lake and we had a delicious taco dinner! This morning, we did a major cleaning in/out of the MoHo before departing at 10am on our way to our final destination in CO, Steamboat Springs. We had to drive back through Rocky Mountain National Park (this time with the MoHo and toad). A little dicey with the hairpin turns and steep grades up and down, but Mike is a pro! I however have huge anxiety, so had to settle my nerves with a Sofia Coppola mini. The weather was much better today, so the Rocky Mountain views were outstanding and we even saw a few groupings of elk. That’s it for now. Thanks for reading! 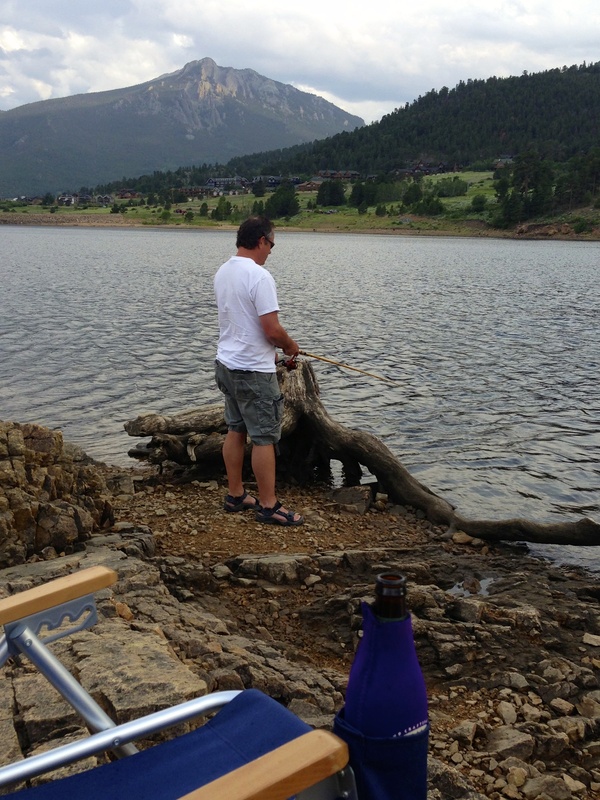 This entry was posted in July 2013 and tagged Colorado, Dumb and Dumber, Estes Park, fishing, National Parks, The Stanley Hotel, wildlife on July 9, 2013 by Traci. Well, we have been busy the last week or so, sorry it has been quiet on the blog front. This post may be a bit long as there is lots to catch up on! Hard to believe we are already into July and are 6 weeks into our trip! 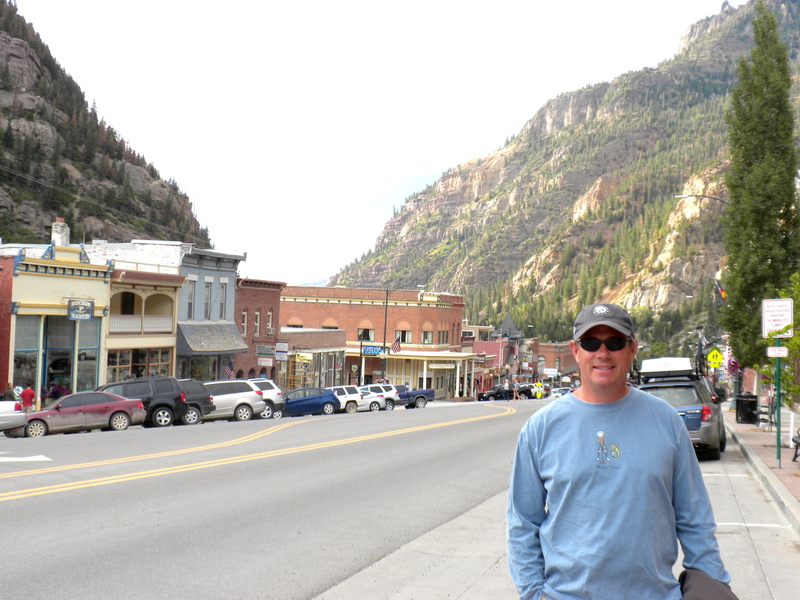 Our first stop was Ouray, CO where we spent a nice quiet three days in the Ouray RV Park. Ouray is likened to the Swiss Alps, a very small mountain town that has a rich mining history in the area. There are lots of little shops and restaurants to visit, and a ton of people using this as their launching point to the wilderness areas around the town. This is the starting point from which many people take off-road trips in Jeeps and other vehicles into the backcountry for several days. 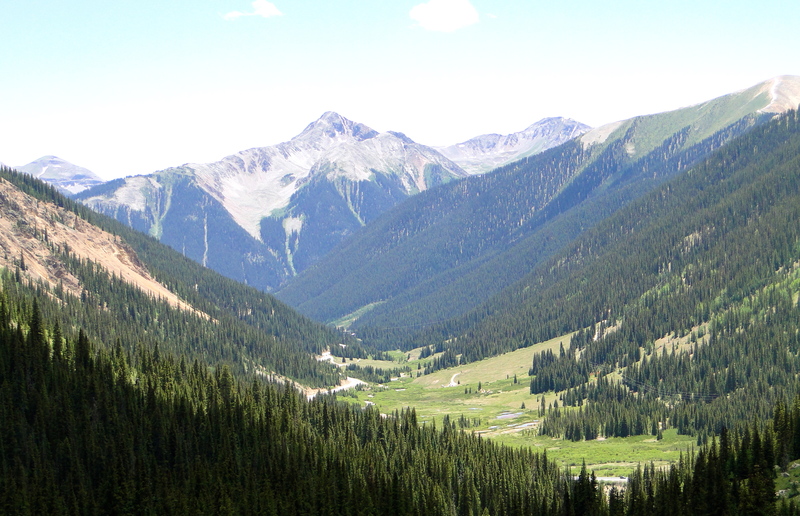 On our first day, we headed over the pass to the south of Ouray to the mining town of Silverton. Just outside of town, we missed a pullout to see a nice waterfall, so I pulled over about 200 yards further up the highway. We jumped out to see if we could see the falls from that point, and somehow I/we locked the keys in the car – while it was running! Long story short, we got back in the car 3 hours later with a coat hanger and pry-bar from the county Sheriff – glad it was only 75 degrees out that day. Silverton was just what you would expect from a mining town of 100+ years ago – 6 to 8 streets, mostly gravel, a few shops on the main drag, most of which are full of tourist goodies, and a few restaurants. We ate lunch at Grumpy’s – fitting after the car episode! The next day we decided to finally get out the golf clubs – 5 weeks on the road and no golf yet – why?! We went back up the road about 25 minutes to Ridgway to the Divide Ranch & Club (it is not worthy of a link). 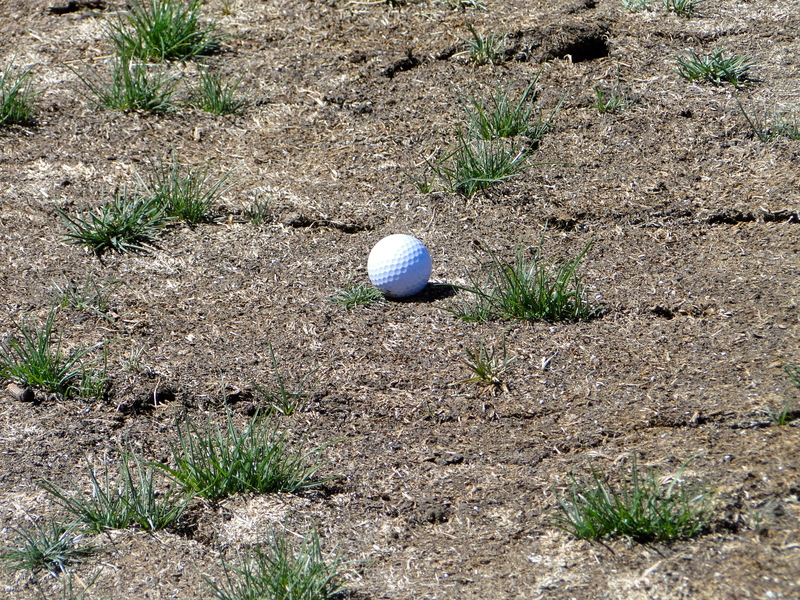 This was one of the worst maintained courses in the history of the golfing world. I know most of the area is in a bit of a drought, but it looked as if there had not been a drop of water put on the course. Really sad because this place had amazing views of the Rocky Mountains and a lot of potential for a great resort type setting. The only water on the course was used for the greens and tee boxes – really good thing we were in the right mindset – otherwise I would have probably gone back and asked for a refund! The next day we were off to Salida. 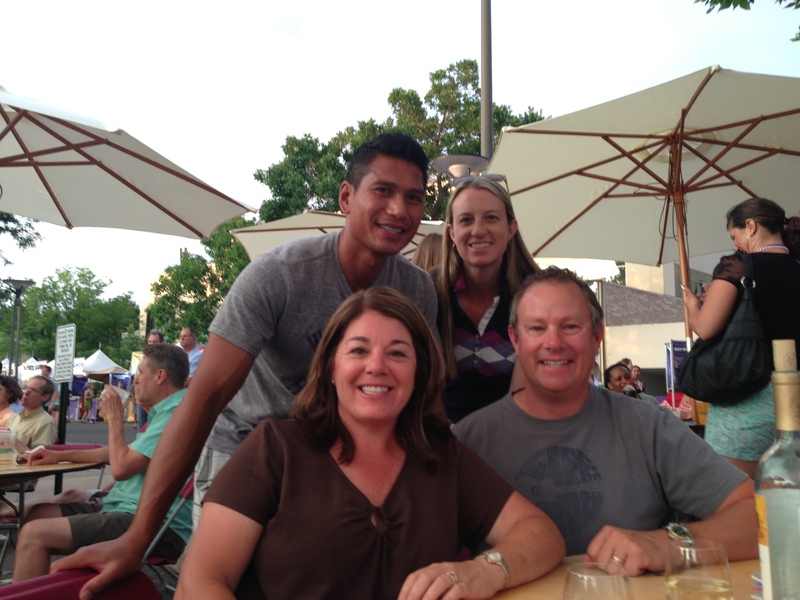 We stopped in Gunnison to have a quick visit with Traci’s brother’s former sister-in-law Jenny. Met for a smoothie and visited for about an hour, great to see her! Gunnison is a very cool spot. We decided to skip Salida, and just go on to Manitou Springs. Long drive, but Salida was just going to be an overnight spot to break up the trip, so we pushed through and got to the Pikes Peak RV Park about 7pm. Nice people, great locations and really well run. We went the mile into town, and found a nice little Mexican place, the Loop Mexican Restaurant (great Marg’s and Tequila selection). We noticed when we were walking through town, lots of sand bags outside many of shops. Apparently they had some massive fires last year, and when it rains hard, the town gets over-run with flash floods because the vegetation is so devastated it can’t hold the water. Cute town, wish we could have spent more time here! 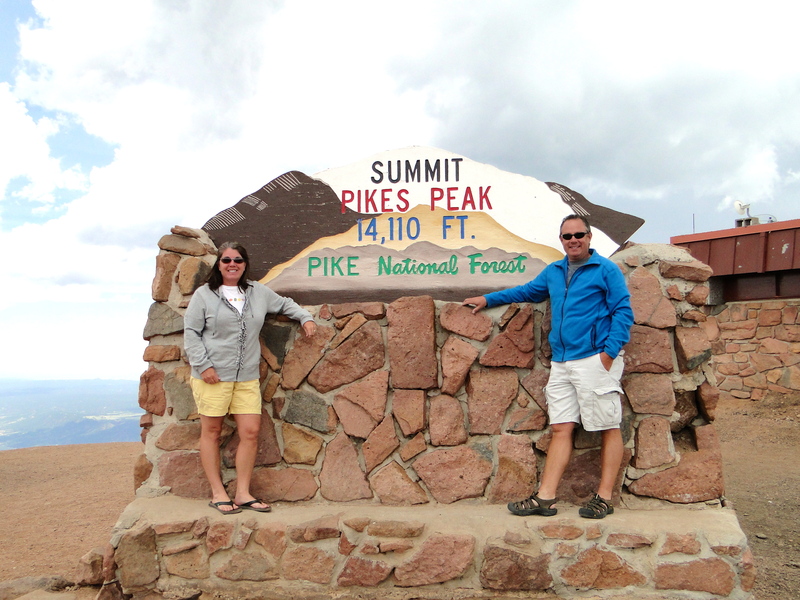 The next day, we ran some errands, and then decided to drive up Pikes Peak, “America’s Mountain.” For those who are not familiar, it is one of the highest places in the continental US that you can visit via car and where the song America the Beautiful was written after. Just so happens that we were there on a Friday, and they were setting up for the Pikes Peak Hill Climb; a road rally race for speed. Each participant tries to drive as fast as they can to the top. (The road is about 18 miles long, but the race is only the last 6 miles or so). We paid our $12 to enter and started up. One of the first signs we saw was that they recommend at least a ½ tank of gas – we start up with just above 1/3. (Yes, we were staring at the gas gauge all the way up, but it all worked out fine). This drive is not for the faint of heart – or heart condition, or small child, or any other health issues. Climbing to an elevation of 14,110, you are really high up and it gets challenging to breathe. I felt it! We stayed for about 30 minutes and it was time to get back down. On the way down, there were signs everywhere that drivers need to go down in first gear. I went down in second, in an automatic transmission, weird to do. There is a ranger station about 1/3 of the way down to check the temperature of your brakes. We registered 399 degrees! If you are under 300 degrees you are fine. Otherwise, like us, you are asked to pull over for 15 minutes to cool the brakes. We did as asked, and then proceeded down and all was good. An amazing drive, and it was cool to see the road set up for a race. Lots of hay bales, and all the signage for the race was in place. The race is the second longest continuous race in the USA, at 91 years running. We did not get to see it in person, but learned that the guy who won this year averaged over 87 MPH! We did most of the course portion at 25-30 MPH, and that was scary enough. On Saturday, we headed out to the Olympic Training Center in Colorado Springs. We took the free tour, and I was very disappointed with the quality of the facility. It felt like we were in a high school gymnasium; I expected to see much better facilities for the athletes to train at. We ended the day in Castle Rock to visit Traci’s sorority sister, Lori Johnson and her family – Bill and daughters Taylor and Abby and dog Sonny, for dinner at their home. We pulled up and the girls had a welcome message in the driveway for us in chalk; the whole driveway was one huge message – very sweet! Dinner, visiting, wine, and we decided to spend the night. Next morning we all went out for a nice breakfast, then headed to Denver for some sightseeing. We checked out Red Rocks, a very cool amphitheater for concerts, which I’m sure rivals the Gorge in Washington. We got a tip from a former co-worker of Traci’s (thanks Joe!) to try out his cousin’s brewery in Denver, Wits End Brewery. 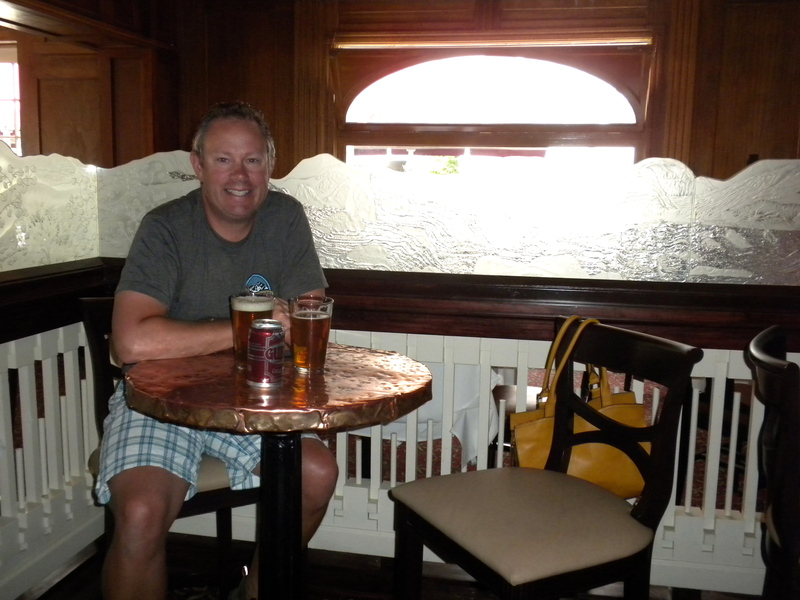 We had a few samples, I bought a growler and then headed back to the MoHo in Manitou Springs. The next day we headed up to Vail to meet up with an another college friend of Traci’s, Ron Webert and his wife Stacy and son Tyler at their mountain home. 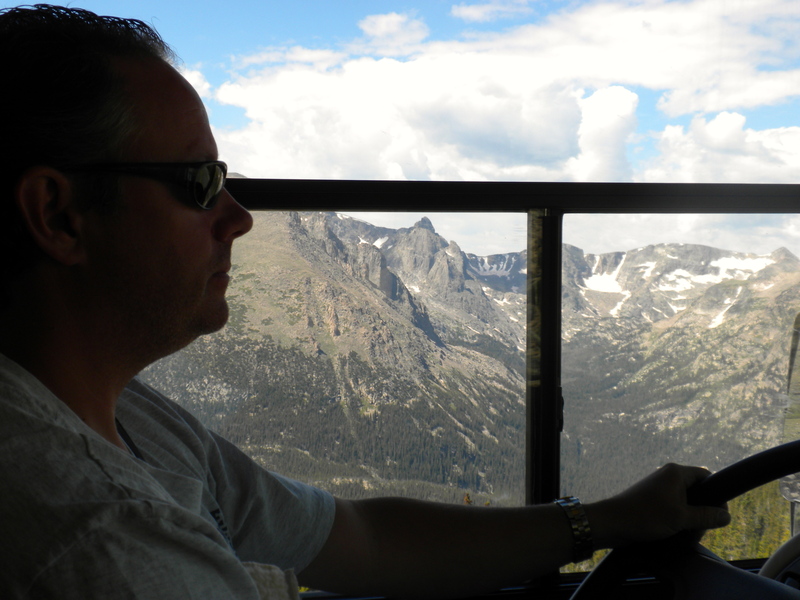 The drive crossed back over the continental divide, up to some passes over 10,000 feet and back down. While on the drive, we got a text message from Traci’s friend Lori whom we were just with in Castle Rock that there was a severe thunderstorm in the Manitou Springs area and the fire and police were evacuating the Pikes Peak RV Park. We had just left there about 8 hours prior – fortunately it was not significant damage to the park, but Manitou Springs got hit hard – lucky we left when we did. 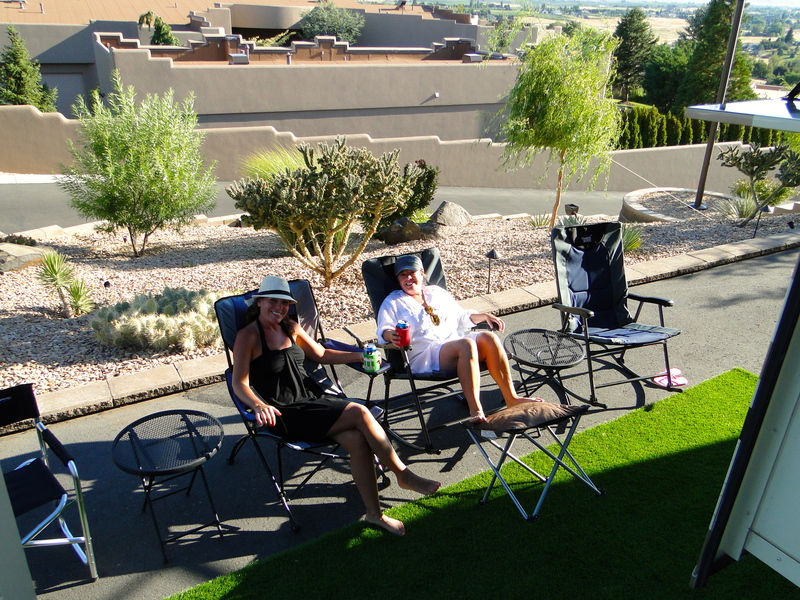 While in Vail, we “boondocked” in Ron & Stacy’s driveway, as we could not find any openings in nearby RV Parks. This worked out perfectly and they certainly treated us right at the Webert B&B! They took us on a ‘little’ hike from the Beaver Creek ski area near their place. 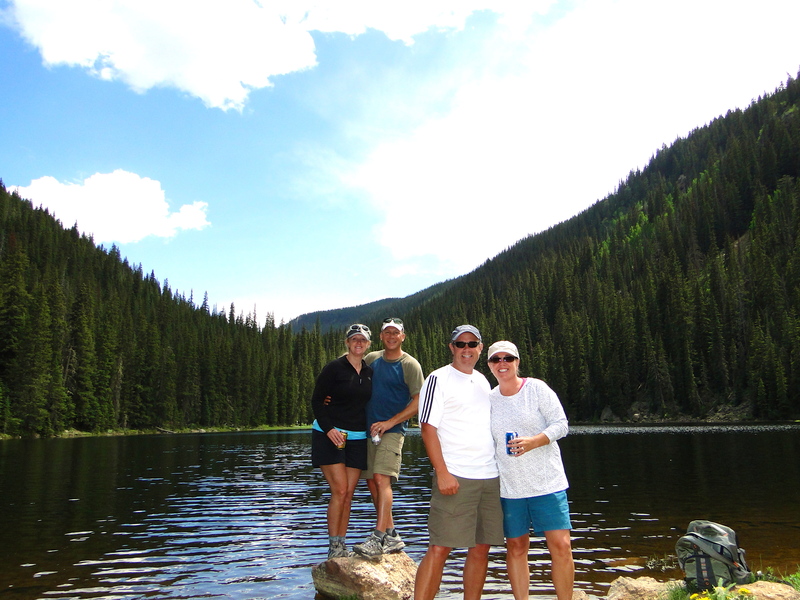 We started at about 8,200 feet and hiked up to 9,800 feet to Beaver Lake where enjoyed a couple of cold ones when we finally made it up. That hike was a bit tougher than we expected; 1,700 feet up and back down and 7 miles; our bodies felt it the next day for sure. Had a nice dinner that night in the Vail village, and a nightcap (or two or three…) at the Red Lion (not the hotel chain) listening to some great old tunes played by the local guy, Phil. Long night, but great fun. We left Vail the next morning and headed to Broomfield to visit another friend of Traci’s who she used to work with at Holland America – Jen and her husband Rod and their kids, Jordan & Bella. Again, we were fortunate to park in front of their house since we weren’t able to find a place to stay. Apparently 4th of July is quite a busy week! We had a great BBQ dinner at their house and had fun catching up. They took us to their local neighborhood fireworks celebration that night and it was pretty impressive! The next day was 4th of July. We golfed with Rod & Jen that morning, then headed into Denver for the Rockies game at Coors Field. My friend Matt who works for the Mariners scored us some great tickets behind home plate. It was a perfect night for a ball game, the Rockies won and the night ended with a killer fireworks show right in the stadium! The next day we headed into Boulder for the day. A very cool, hip town with lots of character and full of restaurants and breweries. Had a great day then went with Rod, Jen & Bella to an Art Festival in the Cherry Creek area of Denver. Apparently the richest zip code in Colorado. Ate some good food, drank some wine, listened to some music and soaked it all in! A very fun last night with friends. 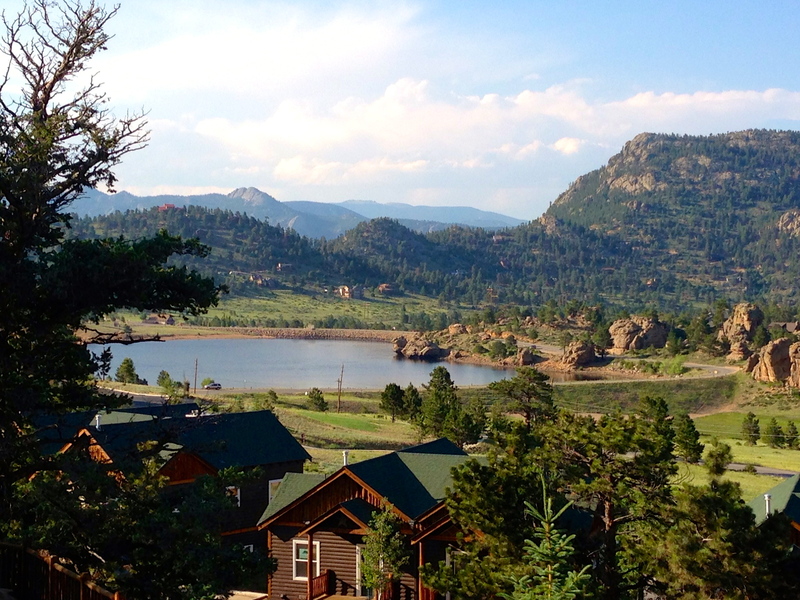 Today, we head north to Estes Park which is kind of the gateway to Rocky Mountain National Park. It has been a great past 10 days catching up with old friends, especially for Traci. It has been nice to have some interaction with people who know us other than small talk with fellow campers or just talking to each other. So far, Colorado has been a definite highlight. We really wish we had more time here especially in the Denver area. We didn’t make it to Golden to the Coors Brewery or to a concert at Red Rocks, which we would have liked to have done – next time! 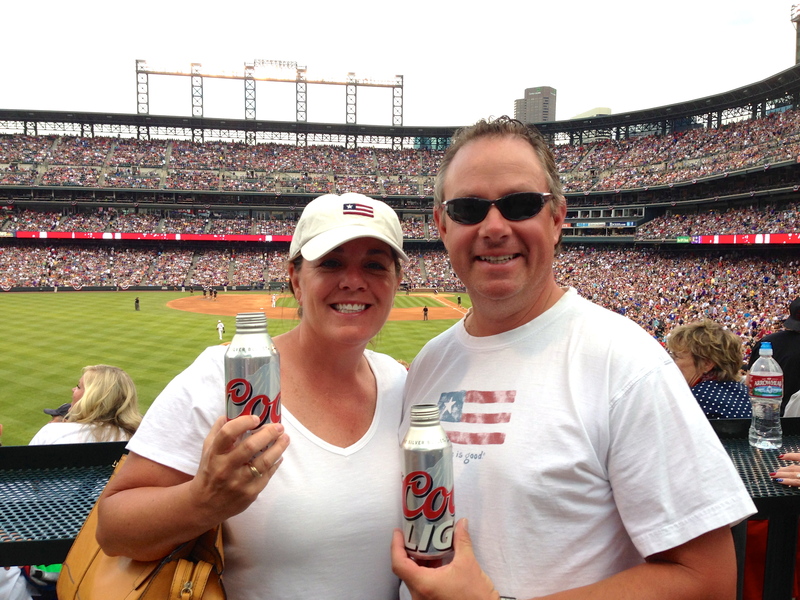 This entry was posted in July 2013 and tagged Art Festival, Breweries in Colorado, Broomfield CO, Castle Rock CO, Colorado Rockies, Coors Field, hiking, Olympic Training Center, Ouray CO, Pikes Peak, Red Rocks, Vail on July 6, 2013 by Mike.